Over several decades the size of computers have been gradually shrinking whilst the efficiency and power of them has been growing. The latest version of this trend, wearable technology, sees the power of computing adapting to our bodies and lifestyles whilst shrinking to sizes previously inconceivable. Wearables has taken the consumer market by storm with BI Intelligence projecting that total sales in 2014 will reach 100 million and will climb to 300 million in 2018. From the popular Go-Pro which allows you to record through a mounted video camera on your helmet, to the Mota SmartRing which can cram those ever important notifications to a wearable device small enough to sit on your finger, there are wearable devices available to cater to all the needs of the consumer market. But wearable technology also provides benefits for the enterprise and we may even see BYOW (Bring Your Own Wearable) policies introduced by organizations. Whether it’s by being able to access data without having to take out a mobile device or by knowing that your employer is carefully overseeing your safety, wearable tech has been said to increase job satisfaction by 3.5% and improve technician productivity by 8.5%. 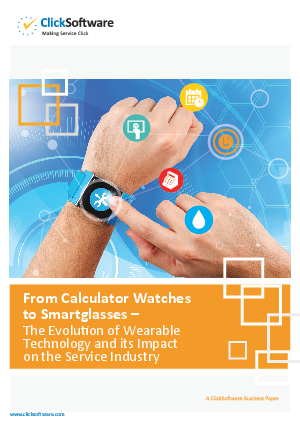 From calculator watches to smart glasses, this paper will guide you through the evolution of wearable technology and its impact on the service industry. Download this whitepaper to understand how your business can benefit by getting ahead of the trend through the implementation of wearable technology within your organisation.